The Zuni Pueblo is the largest and most populous pueblo in New Mexico, with 724 square miles and over 9,000 people. The Zuni and their ancestors have been at this site for over 2,000 years. The soil here is rich and there is plenty of water for irrigation. 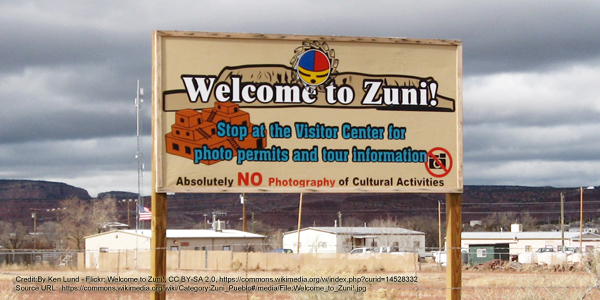 The Zuni was the first pueblo to be visited by the Spanish explorers in the 1500's. It was thought to be the site of one of the "Seven cities of gold." This was actually a lie perpetuated by a rogue Spanish explorer. A year later, Coronado's expedition came looking for streets lined with gold and instead found a hostile Zuni people. War ensued, and the Zuni relented after a period. The Zuni accepted the Spanish intrusion, but never adopted the Spanish ways. Many Friars at the mission here were killed by the Zuni. In the mid-1800's the Zuni had become the wealthiest and largest political force in the region. They grew crops and became sheepherders. Settlers began to creep into the area, as did the transcontinental railroad. In the end, the Zuni lost most of their land. There are several communities on the reservation, none of which are dominated by the adobe style houses that most other pueblos have.